From the county's role in the "Trail of Tears" to the city's role as a Trading Post on the Ohio River, both the County and the City of Smithland have a rich historical heritage. The late 1790's brought John Smith to the area of the confluence of the Ohio and Cumberland Rivers having been sent by Zachariah Cox to scout a location for a settlement. Meeting stiff opposition from the elements and one General Wilkinson of Fort Massac who had plans of his own to establish a commercial settlement in cooperation with the Spanish, Cox's efforts were thwarted when the General convinced the President and the Secretary of War the Cox was building a boat to use as a pirate ship and for making war against the Indians. Cox was arrested and upon his eturn to the area, found that all his possessions had been taken from him. He continued his efforts for a short time but disappeared from the records around 1803. Enduring many hardships, the small community named Cox's good friend and associate John Smith, slowly grew and became a stopping point for boats transferring passengers and produce. Laid out on a plat in 1805, but not recorded until 1837, the town plan included six blocks alng the river and two blocks back. This same plat is still used for the location of lots in Smithland. In it's early days, the town had a reputation of being a lusty, bawling river town, full of unsavory characters. Soon however lots were bought by people of a much different and better character who built homes and established businesses including Inns and Taverns, some of which are reputed to have had tunnels used by escaping slaves. Around 1800, a road was ordered to be scouted and established between Smithland and Eddyville, the county seat at the time. Mid-December 1811 brought a major earthquake along the New Madrid fault that had many Smithland residents frightened into believing it was the end of the world. Awakened by heavy rumbling, roaring, hissing sounds and explosions that sounded like canon fire, residents fled into the streets to escape falling chimneys as houses shook. Tremors continud for several months afterwards. On the evening of that quake, about 3 miles above Smithland, at place known as "Rocky Hill" (the home of the nephews of Thomas Jefferson), a grisly murder occured. Lilburne Lewis, son of Col.Charles Lilburn Lewis had been active in all affairs concerning the town. Having fallen on hard times he began to drink heavily which brought about major changes in him. When "George", one of his slaves broke a pitcher belonging to his deceased mother, Lilburne gathered all his slaves and murdered George with an axe in front of them. This story is well documented in the 1976 book "Jefferson's Nephews" by Boynton Merrill, Jr. This book as well as many others are available from the Livingston County Museum. The 1830's saw the establishment of saw mills, a boat yard for the building of boats, the Smithland Dock Co., a brickyard, blacksmith shop, iropn factory, grocery and dry goods stores and The Smithland Herald. 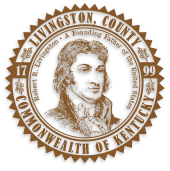 By 1840 the town had grown in size and population and 1842 saw the formation of Crittenden County from Livingston county's northern section and the county seat was relocated to Smithland where a new courthouse was built and accepted by the Court in 1845. 1884 and 1937 brought major floods to the Ohio River valley. 1961 found Smithland temporarily renamed "Albany, NY" for the filming of a portion of "How the West Was Won" starring Jimmy Stewart, Debbie Reynolds, Walter Brennan, and many others and featured many Smithland residents as extras. Lucy Jefferson Lewis, sister of President Thomas Jefferson, died in 1811. She was buried on the grounds of the Rocky Hill plantation, but the gravesite has been lost. The estate is now in ruins. 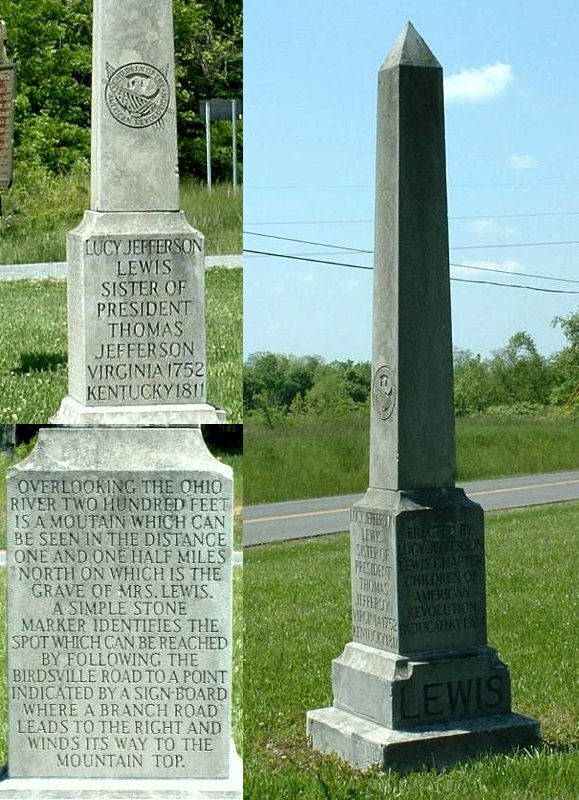 A monument honoring Lucy Jefferson Lewis was erected by the Daughters of the American Revolution at the intersection of U.S. Route 60 and Kentucky Route 137.